WASHINGTON, DC (NASA PR) — NASA has selected nine science instruments for a mission to Jupiter’s moon Europa, to investigate whether the mysterious icy moon could harbor conditions suitable for life. 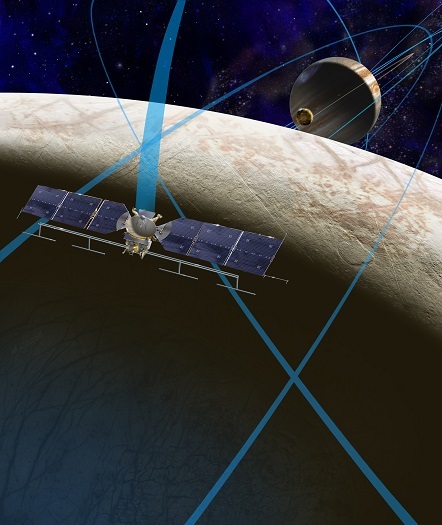 A thermal instrument will scour Europa’s frozen surface in search of recent eruptions of warmer water, while additional instruments will search for evidence of water and tiny particles in the moon’s thin atmosphere. NASA’s Hubble Space Telescope observed water vapor above the south polar region of Europa in 2012, providing the first strong evidence of water plumes. If the plumes’ existence is confirmed – and they’re linked to a subsurface ocean – it will help scientists investigate the chemical makeup of Europa’s potentially habitable environment while minimizing the need to drill through layers of ice. NASA’s Science Mission Directorate in Washington conducts a wide variety of research and scientific exploration programs for Earth studies, space weather, the solar system and the universe.